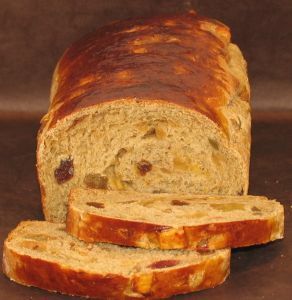 Bara brith, sometimes known as "speckled bread", can be either a yeast bread enriched with dried fruit or something more like a fruitcake made with self-raising flour (no yeast). It is traditionally made with raisins, currants and candied peel. There are many different recipes for this bread, which is baked and sold commercially in many parts of Wales. The yeast version of bara brith has a limited shelf life and is best eaten as soon as possible. The version made with self-raising flour can be kept for a long time. Welsh recipes favour soaking the dried fruit in tea overnight before the baking. In Argentina, bara brith is also known as torta negra ("black cake"). One of the most traditional foods coming out of the Chubut valleys, it was brought by the Welsh settlers who started arriving in the country in 1865.